It’s overcast this March morning, on our Travel Australia, leaving the Lang Lang Caravan Park. 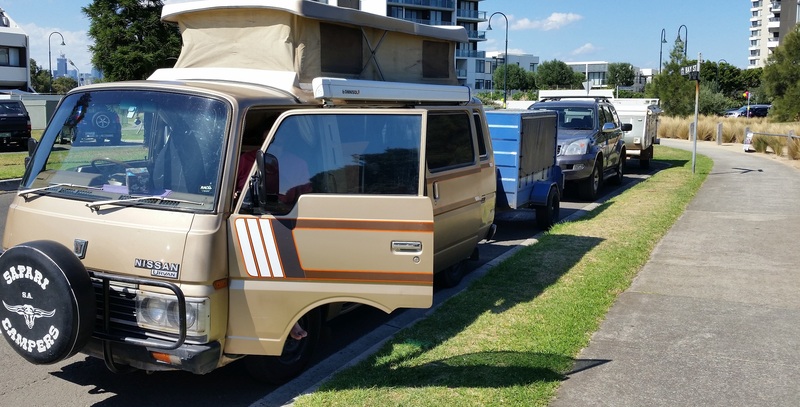 We’ve packed up our little Nissan Urvan campervan and with trailer firmly attached, we’re heading for Port Melbourne where the ship taking us to Tasmania is waiting. The weather system that had brought the wind sweeping across the plains has passed and blue skies are predicted for this afternoon. It’s normal for the drive from the eastern end of Victoria towards Melbourne to be buffered by headwinds. Weather systems originating around the continent of Antarctica move eastwards, highs, lows and capricious cold fronts, they move across the plains of Victoria and the 300 kilometres of this flat country offer little resistance. We minimized our exposure by finding protected areas to camp and staying put twice, for two days spending the time reading, writing and simply listening to the sounds of the wind rushing through the trees and whistling around buildings. This diapause was no burden, no inconvenience, this was an opportunity to cease movement to revel in the experience, the joy of holing up, snug and safe, warm and comfortable while all around was in turmoil. These are memorable times. 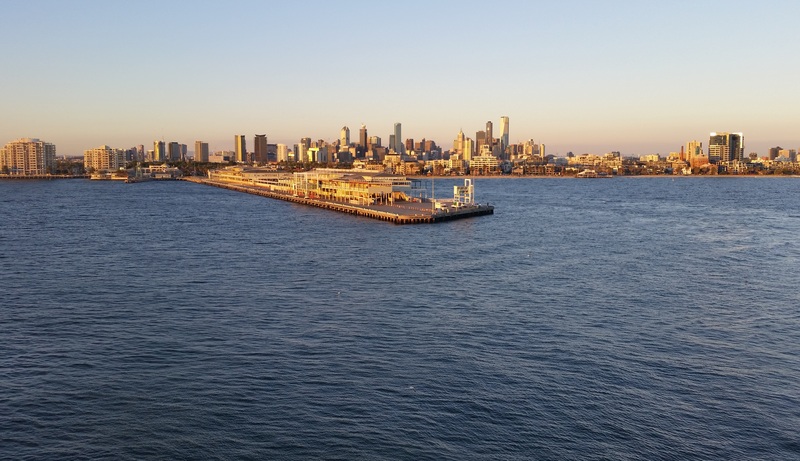 We’ve developed a renewed interest in the weather, given the notoriety of Bass Strait and the hazards of negotiating its relatively shallow waters. Strong storms can blow up fairly quickly and there is nothing much between Antarctica and Tasmania. We’ve heard stories of crossings one would prefer to avoid. 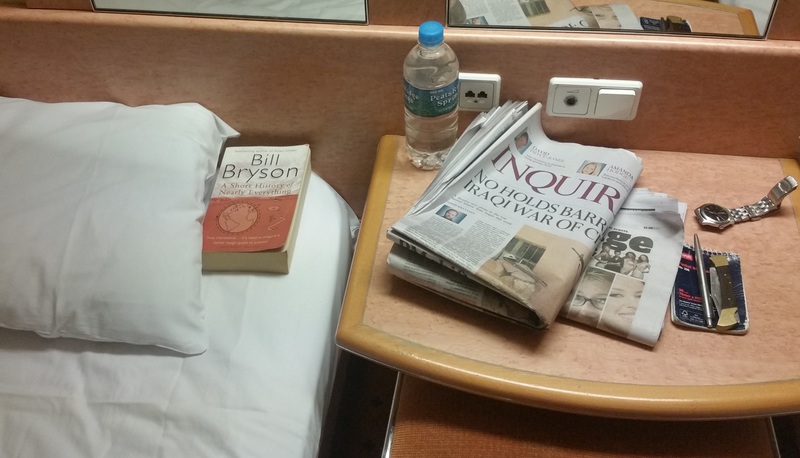 (If it got too bad, Julie suggested, I should buy a Viagra so I won’t roll off the bunk.) To keep costs to the minimum we opted for sharing all-male, all-female 4-berth cabins, so I figure I’ll give her advice a miss, assuming they put me in an all-male cabin. 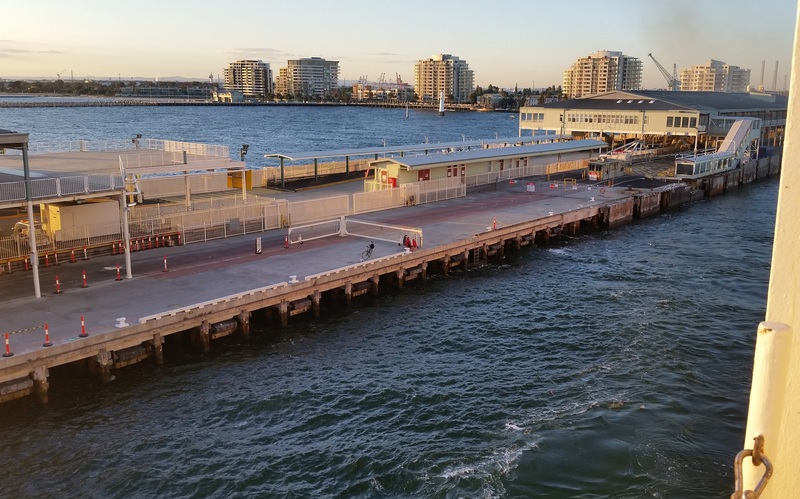 The distance to Port Melbourne is only 64 kilometres, an hour’s drive so we stopped at Tooradin for a coffee, about 25 ks from the Lang Lang Caravan Park on West Port Bay. 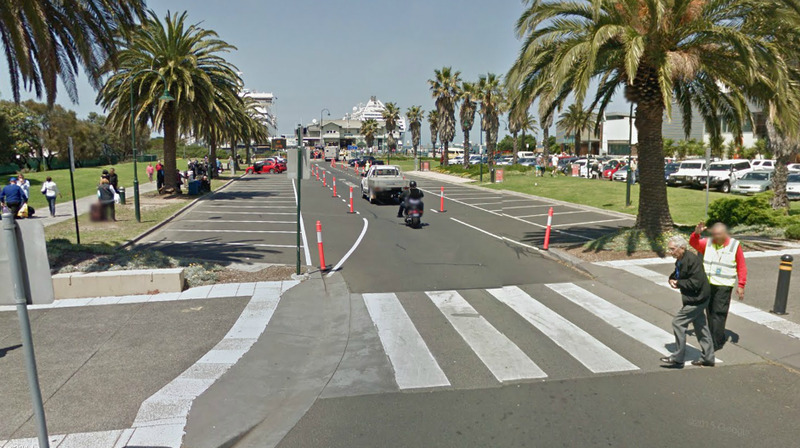 This is the only place where the South Gippsland Highway itself actually touches the bay and it soon becomes uncomfortably apparent we are nearing the city as grasping municipal hands reach out to one pockets and tug at one’s sleeve. It’s enough, one would think to have to pay to park but here you also have to pay to use the boat ramp. I have no desire to live in such a rapacious environment even one as pleasant as this. Unfortunately there were no signs indicating parking while waiting so we followed another early comer around several back streets to find somewhere to get off the road. Like a number of others, we found a parking spot about 1 kilometre west of the port, beside a pleasant park called the Westport Reserve. 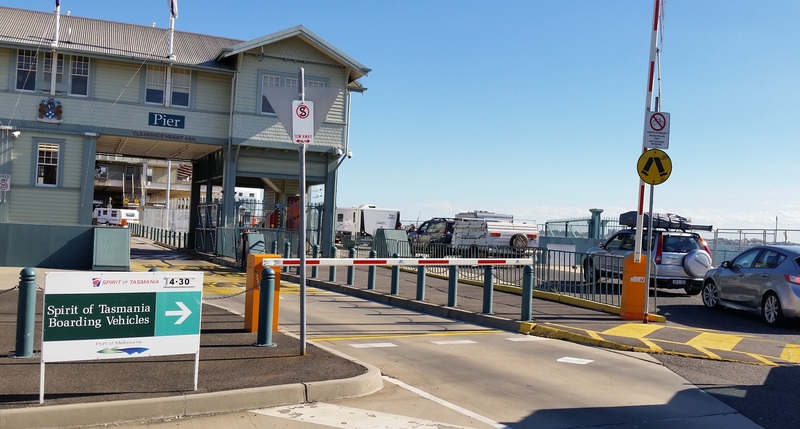 In a phone call to find out where we could park at the terminal, we were advised to cool our heels until 4.30 and then go back to the wharf. Three hours is no problem, especially when the wind has dropped and the sun is out. We easily fill in time, making lunch, strolling the beach, taking a few pics and of course chatting with the other early birds. 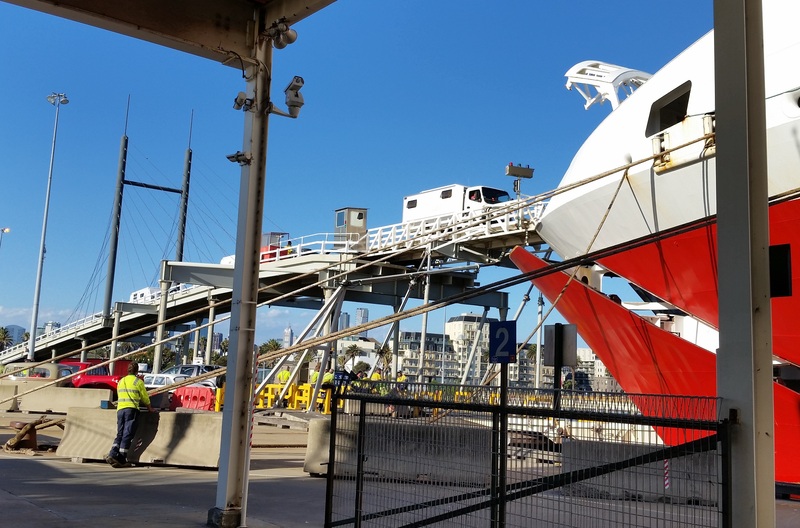 A whole row of caravans, cars with trailers and assorted loaded vehicles were lined up with us and we had the benefit of seeing our ferry, Spirit of Tasmania in perspective against the white cruise ship whose passengers were adding to the congestion around the wharf. We arrived on the dock at 4.45 to be greeted with a very long line of vehicles already in the queue. It was slow going as we had to pass through quarantine which involved a search of every vehicle. There is a long list of prohibited goods and they even took our well protected and restrained spare gas bottle because it was not secured with a metal strap. We sat in the queue most of the time with engine switched off but it was intriguing speculating on how they were to get us aboard. When we saw the ramp and the processionary caterpillar of vehicles, we had visions of getting halfway up and having to stop, the weight of the trailer making it impossible to restart with our slippery glazed-over clutch. When our turn came, we dawdled, figuratively kicking over a few stones, until the ramp was completely clear all the way to the top. With a bit of a run up in first gear we sailed up like it was nothing. Sigh. The cruise ship had departed during the 2 hours of waiting but we were safely parked on board and catching the ferry was a concern behind us. 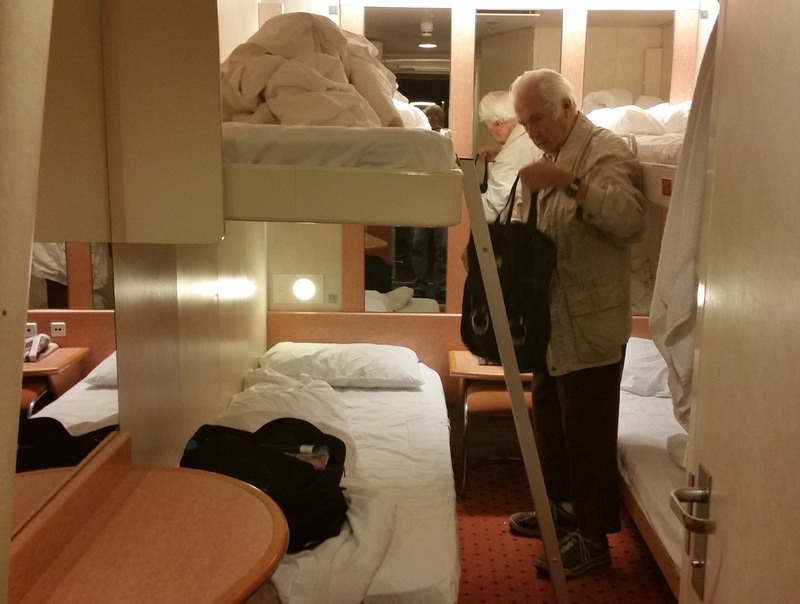 We found our cabins easily enough and stowed our overnight bags. There is no access to the vehicle decks so whatever has been left behind in the vehicle, stays there. I was sharing the cabin with another Dan, a young bloke going to Tassie for a permaculture conference. I also met John, a guy about my age, delivering a car (to a relative I think) having done the trip several times and an avuncular older gentleman who turned out to be 88. I had been assigned a bottom bunk but he was in the top bunk opposite me and fortunately, still nimble enough for the task. Given the small space, I was hoping none of my companions had Barcoo rot around the Niagaras or other less than endearing qualities. I needn’t have worried. The departure event was exciting, even impressive for us first timers. By the time we were under way, dinner was available for those who eat early. After a drink we headed into one of the dining areas and after dinner took up conversation with Norman, a guy sitting alone next to me. He was an average sort of guy, in his late forties I suspect, slim and looked very fit. A charity cycling event riding around parts of Tasmania had brought him and a number of others on board for the crossing. He was sitting quietly having dined on his own and lingering long over a half-bottle of red. After we finished eating we struck up a conversation and hit it off immediately. The half-bottle was replaced with a fresh one and we soaked up a pleasant hour or more across a wide range of subjects, all the most interesting but socially dangerous ones, politics, religion, immigration among others. Far and away the one that got the most attention was religion, a subject in this country that continues to surprise me. It was great fun and I participated with some alacrity, not least because he was genuinely surprised by and interested in points of view he had never previously encountered. In some ways he was both aghast and fascinated at the same time having been brought up in a religious environment, the Jesuits or Fondling Fathers or something and where the monsignor was a regular dinner guest. After his third half-bottle Norman was having trouble concentrating so he bought a full bottle and we left him to do some more thinking on his own while we wandered about a bit before having coffee and retiring for the night. It would be uncharitable of me to speculate that by the time Norman hit the sack he would have been as blind as a welder’s dog however it does seem likely. When I got back to my cabin, uncle was asleep and young Dan was just getting into his bunk. As I was getting my shoes off, John came in and we started chatting, which lead to a discussion about his choice of reading, a Bill Bryson book ‘A Short History of Nearly Everything’. This book is of some significance to me as the inspiration for my ‘Earth History’ web site which I have been working on for 5 or 6 years. When the conversation developed into a discussion about all things important in the universe, this perked up the interest of Dan who joined the discussion and even invoked some contribution from Uncle Octogenarian whom I thought was asleep in the top bunk. We could easily have talked for hours but it was late so after 45 minutes or so we turned off the lights. Unfortunately the combination of strong coffee and the unexpected good conversations meant that sleep escaped me for the next 6 hours. I did not sleep at all and checked off the passing of each hour with watch and phone. I decided I would wait until 5.15, half an hour before the wake up announcement, to dress and pursue a morning coffee. Despite my best efforts, this woke the others and John asked me to sign his book with a comment about the web site. Amazingly the conversation took off again as though we had not slept, which in my case was true. I was asked so many questions and they were so interested, the entire half hour to the wake-up announcement passed before they even got up. They really wanted to discuss more but we had to go and I needed a coffee. 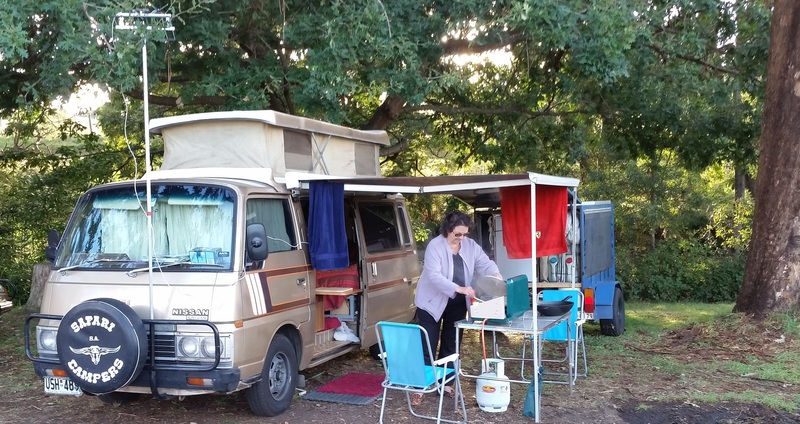 We had to hang around until 7 o’clock before the drivers on our deck were allowed to go to their cars but eventually we drove our campervan and trailer off the ferry in Devonport and retrieved our gas bottle. Half an hour later we pulled into the car park adjacent to McDonalds on the opposite side of the river. The next task was not so easy, tackling the 100 kilometres to Launceston. I could only drive for about 30 minutes before I needed to pull up and have a sleep. My concentration was waning and it could easily become dangerous. I crawled into bed and dropped off immediately. Julie graciously sat and read while I fixed the problem for an hour or so and by 10.15 we were back on the road. We re-fulled in Launceston but were reluctant to take on too many steep hills with our glazed clutch so we took the road north following the aesthetically uninspiring Tamar River for 50 kilometres to GeorgeTown, situated on the eastern bank of the estuary. Maybe we were tired, maybe it was slightly overcast, maybe we just expected more, but George Town didn’t excite us at all. We stopped at the information centre but their interest was only in directing us to where we could stop if we paid for services, as was their job. It was still early and really, we were not enamored with the scenery or general look of George Town so we pushed east another 50ks to Bridport. The road to Derby turned off a little before the township and by now had made the decision to stop in Scottsdale overnight so we decided to press on and leave the sightseeing, including giving George Town another chance, to another time. In hindsight, if we had made the decision earlier and perhaps not been so tired, we could have taken a more direct route across the Tasman Bridge, the only crossing of the Tarmar River. Planning the day’s drive probably has some advantages at times. 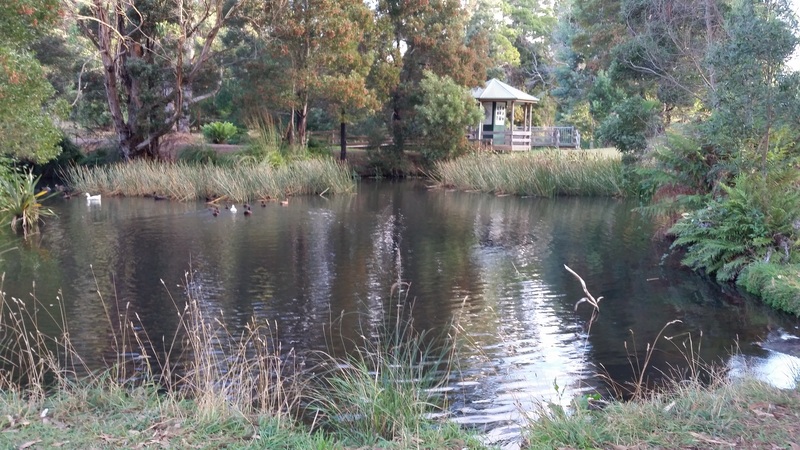 Scottsdale, about 20 kilometres from the northern coast of Tasmania is home to Northeast Park, which is well-known in camping circles as an hospitable and scenic place to stop for a day or two, although criticized by the whining few as noisy. We set up camp, had a late lunch and slept until 6pm. Late in the afternoon I took a stroll around to ‘discover’ the park and found it was a rehabilitated creek that at one time had been altered to host diving boards and swimming carnivals before falling into disrepair. It really was a very pleasant stop with hot showers available for the princely sum of $3. TV reception was too poor for our simple aerial but neither that nor the occasional passing of the log trucks caused us any issue. By the next morning we were ready for our next house-sitting assignment in Derby a village just 30 kilometres further inland and where three large dogs are expecting us for lunch. You can forward this article to a friend, assuming you have one, by clicking on the little envelope below.